Sorgulamaya dayalı öğretim (SDÖ) yönteminde minimum öğretmen rehberliği öğrenmeyi güçleştirebilir; hatta kavram yanılgıları kazanmaya da neden olabilir. Bu nedenle bu çalışmada SDÖ yönteminin “sonuca varma” aşamasında “yapı iskeleleri” kullanarak rehberliğin düzeyi artırılmış (YİSDÖ) ve kavram yanılgılarını gidermedeki etkileri incelenmiştir. Öğrencilerin bilimsel süreç becerileri (BSB) kişisel özellik olarak belirlenmiş; uygulanan yöntemlerin kavram yanılgılarını azaltmadaki etkileri düşük, orta ve yüksek BSB’lere sahip öğrenciler için kıyaslanmıştır. Dolayısıyla bu çalışma bir Kişisel Özellik-Uygulama Etkileşimi (ÖZUYET) araştırmasıdır. Çalışmaya 2015-2016 öğretim yılında Fırat Üniversitesi Fen Bilimleri Öğretmenliği bölümünde okuyan birinci sınıf öğrencileri katılmıştır. Öğrenciler deney ve kontrol grubuna seçkisiz atanmış, kontrol grubunda SDÖ, deney grubundaysa YİSDÖ yöntemi uygulanmıştır. Veriler “Bilimsel Süreç Becerileri Testi” (ön-test) ve “Basit Elektrik Devreleri Tanı Testi” (son-test) kullanılarak toplanmıştır. Verilerin analizindeyse Johnson-Neyman tekniği kullanılmıştır. Sonuç olarak BSB’leri yüksek olan öğrencilerin kavram yanılgılarını azaltmada SDÖ yönteminin YİSDÖ yöntemine kıyasla daha etkili olduğu gözlenmiştir. Ancak BSB’leri düşük olan öğrencilerde, YİSDÖ yönteminin daha etkili olduğu görülmüştür. In inquiry teaching (IT), minimum instructor guidance may interfere with learning, even cause to acquire misconceptions. Therefore, in this study, the level of guidance was increased by using “scaffolding” in the phase of “drawing a conclusion” in IT (Scaffolded Inquiry Teaching - SIT), and their effects on remediating misconceptions were investigated. Science Process Skills (SPS) of the students were identified as “aptitude,” and the effects of the treatments on refining misconceptions were compared for students with low, moderate, and high level of SPS. Thus, this study is an AptitudeTreatment Interaction (ATI) research. Freshman students studying in the department of Science Education at Fırat University in 2015-2016 academic year participated in the study. The students assigned to the groups randomly, and IT was used in the control group while SIT was used in the experimental group. Data were collected by using “Science Process Skills Test” (Pretest) and “Simple Electric Circuits Diagnostic Test” (Posttest). To analyze the data, Johnson-Neyman Technique was used. In conclusion, IT was observed to be more effective than SIT on refining misconceptions of the students with high level of SPS. Nevertheless, for the students with low level of SPS, SIT was observed to be more effective. Berliner, D. C., & Cahen, L. S. (1973). Trait-treatment interaction and learning. Review of Research in Education, 1, 58-94. Brown, A. L., & Palincsar, A. S. (1989). Guided, cooperative learning and individual knowledge acquisition. In L. B. Resnick (Ed. ), Knowing, learning and instruction, (pp. 393-451). Hillsdale, NJ: Lawrence Erlbaum Associates. Burns, J. C., Okey, J. R. vd. (1985). Development of an integrated process skill test: TIPS II. Journal of Research in Science Teaching, 22(2), 169-177. Cronbach, L. J. (1957). The two disciplines of scientific psychology. American psychologist, 12(11), 671. Cronbach, L. J., & Snow, R. E. (1977). Aptitudes and instructional methods: A handbook for research on interactions. Irvington. Fraas, J. W., & Newman, I. (1997). The use of the Johnson-Neyman confidence bands and multiple regression models to investigate interaction effects: Important tools for educational researchers and program evaluators. Multiple Linear Regression Viewpoints, 24(1), 14-24. Fraenkel, J. R., & Wallen, N. E. (1996). How to design and evaluate research in education. McGraw-Hill. Furtak, E. M., Seidel, T. vd. (2012). Experimental and quasi-experimental studies of inquiry-based science teaching a meta-analysis. Review of educational research, 82(3), 300-329. Gallagher, J. J. (2007). Teaching science for understanding: A practical guide for middle and high school teachers. Upper Saddle River, NJ: Pearson Education. Hake, R. R. (1998). Interactive-engagement methods vs traditional methods: A six-thousand student survey of mechanics test data for introductory physics courses. American Journal of Physics, 66(1), 64-74. Hammer, D. (1996). More than misconceptions: Multiple perspectives on student knowledge and reasoning, and an appropriate role for education research. American Journal of Physics, 64, 1316-1325. Koran, M. L., & Koran, JR., J. J. (1984). Aptitude-treatment interaction research in science education. Journal of Research in Science Teaching, 21(8), 793-808. Linn, M. C., & Eylon, B. S. (2006). Science education: Integrating views of learning and instruction. In P. Alexander & P. Winne (Eds. ), Handbook of Educational Psychology (pp. 511-544). Mahwah, NJ:Erlbaum. Linn, M. C., Husic, F. vd. (2006). Technology enhanced learning in science (TELS): Research programs, Educational Technology, 46(3), 54-68. Lubin, A. (1961). The interpretation of significant interaction. Educational and Psychological Measurement, 21, 807-817. Özsoy, S., & Özsoy, G. (2013). Eğitim araştırmalarında etki büyüklüğü raporlanması. İlköğretim Online, 12(2). Peşman, H. (2005). Development of a three-tier test to assess ninth grade students’ misconceptions about simple electric circuits. (Yayımlanmamış Doktora Tezi). Orta Doğu Teknik Üniversitesi, Ankara. Peşman, H. & Eryılmaz, A. (2010). Development of a three-tier test to assess misconceptions about simple electric circuits. The Journal of Educational Research, 103, 208-222. Slotta, J., & Peters, V. (2008, June). A blended model for knowledge communities: Embedding scaffolded inquiry. In Proceedings of the 8th international conference on International conference for the learning sciences-Volume 2 (pp. 343-350). International Society of the Learning Sciences. Stevens, J. P. (2009). Applied multivariate statistics for the social sciences. New York, NY: Roudledge. Şen, H. C. (2010). 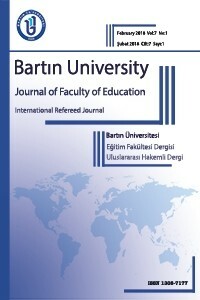 An aptitude-treatment interaction study: The effect of inquiry-based interaction and lecture instruction on high school students’ physics achievement (Yayımlanmamış doktora tezi). Orta Doğu Teknik Üniversitesi, Ankara. Vacha-Haase, T. & Thompson, B. (2004). How to estimate and interpret various effect sizes. Journal of Counseling Psychology, 51, 473-481.